amount of steel required to produce a system. Typical capacities vary from 1 to 50 ton and higher. Runways are available in unlimited lengths. Columns fasten directly to a 6 inch concrete floor or adequately sized foundations. 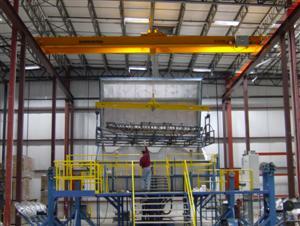 Push type, motor driven, and hand geared bridge cranes are offered. Custom engineered to meet your building specifications. Anchor bolts are supplied when concrete floors are not required. Comprehensive approval drawings supplied in Auto CAD format. Licensed engineers review all system designs. When a new or existing building has enough reserve capacity to resist the longitudinal (along the length of the crane runway) and lateral (across the width of the runway) forces, CraneWerks can attach the columns and runways to these buildings, reducing the amount of steel required to produce an overhead crane system. These systems are good where the requirement is for minimum floor obstructions and where maximum headroom (hook height) is required. Engineering services are available through CraneWerks to help you determine if your building has the required strength to utilize a money saving semi-free standing crane runway system. A main component of a semi-free standing overhead traveling crane system is a top running single or double girder bridge crane designed with the bridge on the top of the runway. 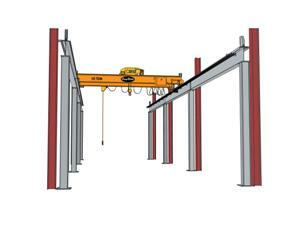 The crane runway is positioned on self-supporting columns. For greatest use and versatility of a work area and to safely manipulate heavy loads of the same or different capacities on the same runway you can use two or more overhead cranes of different capacities and share the same runway. As an example a 10 Ton runway system can be used to support two 5-Ton cranes with no restrictions to the distance between the cranes. A 5 Ton crane runway could just as easily be used to lift 10 Tons as long as it is equipped with two 5 Ton cranes and they are separated by enough distance thorough mechanical separation (buffers) or electronically with distance sensing devices to keep the cranes separated. Other options are available when an application requires load monitoring to protect runways from overload but when versatility of the system is needed including: Load limiting switches, temporary end stops and bridge travel limit switches. Load scaling for monitoring and limiting combined loads form overloading a runway system are one of the modern options that are available today. CraneWerks semi-free standing top running overhead crane structures are compatible with push/pull, hand geared, and motorized single girder bridge cranes as well as double girder cranes. 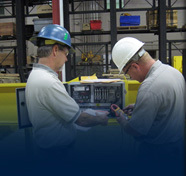 CraneWerks’ engineers provide engineering consultation, troubleshooting, and support from initial design through installation and follow-up. We offer pre-engineered, design build, and turnkey systems through our dealer network around the United States. 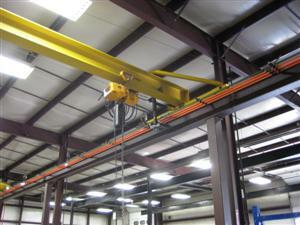 CraneWerks’ overhead traveling crane systems can be customer installed, dealer installed, or installed nationwide by CraneWerks technicians. For a CraneWerks quote on a free standing, top running, header braced crane system; please fill out one of our online Request for Quote Forms. To learn more about our complete lineup of industrial crane runway systems; or for answers to other questions, please call us at 888-544-2121 or contact us. Quotes on all standard runway systems are available within twenty-four hours.